When was the prawn cocktail invented? The earliest reference may be 1962 when Coronation Street character Annie Walker made mention of it. Known for her condescending manner and delusions of grandeur, Annie Walker was the perfect PR for Fanny Cradock whose definite recipe appeared in 1967 and changed the face of – well of the prawn cocktail. One of the most sordid little offerings is the ubiquitous Prawn Cocktail with a good old ground padding of lettuce cut with a knife and darkening at the edges, a tired prawn drooping disconsolately over the edge of the glass like a debutante at the end of her first ball and its opposite number – a piece of lemon tasting of the knife – clutching the opposite side of the rim like a seasick passenger against a taffrail during a rough Channel crossing. This kind of presentation almost invariably confirms that the mayonnaise will be that bottled stuff, further sharpened by bottled tomato sauce, that the incidence of prawns will be low, of over-cooked diced potatoes high, whereas if we have not put you off them for life by this time, Prawn Cocktail can be delicious. Start by tearing crisp heart of lettuce and using the pieces to line the base and sides of a glass or bowl, so that when the prawn mixture is filled in all the lettuce does not have to be excavated from the base. Then make up a mixture which comprises 4 oz. fresh, freshly shelled shrimps or prawns (halve the latter), 2 oz. small diced hothouse cucumber with the skin left on, 2 oz. real mayonnaise perked up with a few drops of Tabasco and an additional teaspoonful of strained lemon juice – and absolutely no potato salad at all. Mix the given ingredients in a bowl with 1 tablespoonful thick whipped cream and add the merest flick of sherry or dry Madeira to it. Place about 3 dessertspoonful in each portion on the lettuce. Sprinkle the top first with paprika, then with chives and drive a single, shelled prawn with the head left on, tail end downwards, into the centre so that the head can be lifted out by the diner, the flesh nibbled off and the head discarded easily. Now fringe the glass all round the dome with very thinly sliced unskinned cucumber rounds in overlapping lines and place a very small lemon basket (see diagram) at the side of the glass on the plate, on which you will send it to table. 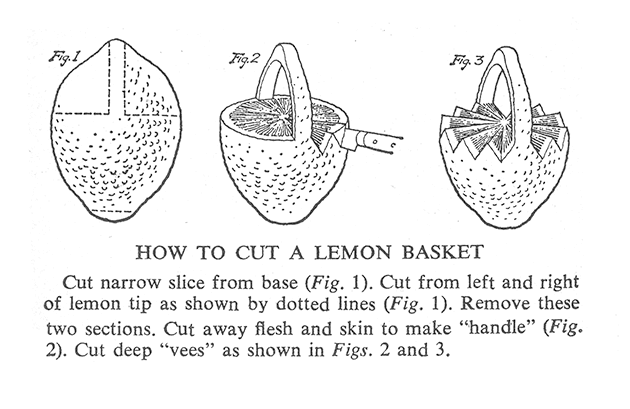 Then the lemon basket can be picked up easily and additional lemon juice squeezed over as desired without getting your fingers in a filthy mess.